Settings are available for adjusting the operation sounds, screen animation, etc. Select �general� on the �setup� screen. "English", "francais" or "espanol" can be selected. On/off can be selected to sound beeps. Select to change the screen color. Select to change the keyboard layout. 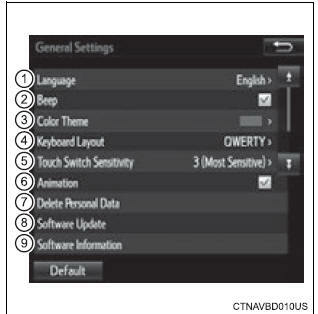 Select to change the capacitive touch button sensor sensitivity. The animation effect for the screen can be set to on/off. Select to update program versions. For details, contact your toyota dealer. Select �default�, and then �yes�. Select �delete personal data� on the �general settings� screen. Check carefully beforehand, as data cannot be retrieved once deleted. A confirmation screen will be displayed. Select �yes�. The following personal data will be deleted or changed to its default settings.